This weekend was father and son's campout so the girls and I had our own fun. We roasted hotdogs on the BBQ Grill and even made Smores. 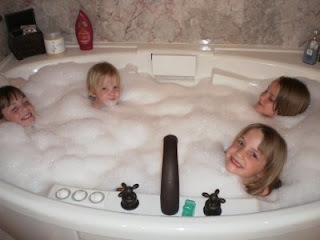 We did some haircutting and the girls had a bubble bath. We rode our bikes to the park for a picnic breakfast, fed the ducks, played on the playground and visited with my friend on the way home. We are anxiously awaiting the return of the smoky dirty boys so we can get to work again.